The fundamental aim of this study is to evaluate whether or not the Internet is an effective new media for advertising. 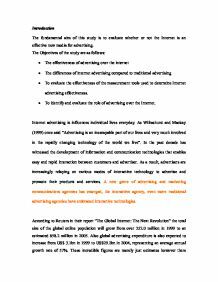 Introduction The fundamental aim of this study is to evaluate whether or not the Internet is an effective new media for advertising. 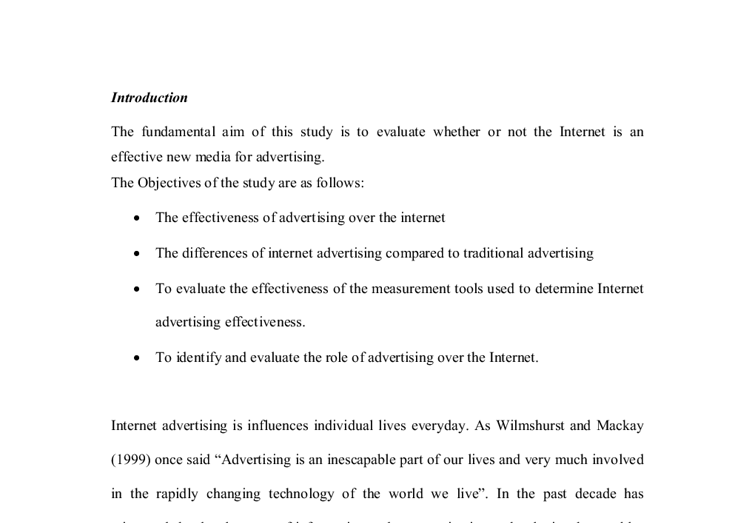 The Objectives of the study are as follows: * The effectiveness of advertising over the internet * The differences of internet advertising compared to traditional advertising * To evaluate the effectiveness of the measurement tools used to determine Internet advertising effectiveness. * To identify and evaluate the role of advertising over the Internet. Internet advertising is influences individual lives everyday. As Wilmshurst and Mackay (1999) once said "Advertising is an inescapable part of our lives and very much involved in the rapidly changing technology of the world we live". In the past decade has witnessed the development of information and communication technologies that enables easy and rapid interaction between customers and advertiser. As a result, advertisers are increasingly relaying on various modes of interactive technology to advertise and promote their products and services. A new genre of advertising and marketing communications agencies has emerged, the interactive agency, even more traditional advertising agencies have embraced interactive technologies. According to Reuters in their report "The Global Internet: The Next Revolution" the total size of the global online population will grow from over 252.0 million in 1999 to an estimated 858.2 million in 2005. Also global advertising expenditure is also expected to increase from US$ 3.1bn in 1999 to US$29.2bn in 2004, representing an average annual growth rate of 57%. These incredible figures are merely just estimates however there must be some force that motives organisation to invest in such massive advertising expenditure. The Internet emerged as a new advertising and marketing media in 1994(Admedia.com). The Internet has emerged as a medium for marketing and advertising since 1994. The Internet is different from conventional advertising media in several respects. First, it can serve as not only a communications channel but also a transaction and distribution channel. ...read more. The subject of Internet advertising has been research on in virtually in all aspects. This study will include views from authors for and against the many areas that is touched in this study. However, secondary data it self has its own advantages and disadvantages. The advantages of secondary data are it is easy to collect, as someone else has already researched it. Furthermore there is an abundance of secondary information that can be collected from various sources. As compared to primary research collection secondary research is relatively cheaper to collect. On the other hand, relying solely on secondary data for research purposes, according to Oliver (2002), is " you can almost never really understand the full circumstances behind the research design and the collection of the data". Other disadvantages includes the fact that it is less specialised than primary data and it does not offer up-to-date information, which could mean that is less reliable. Primary Research The major difference between primary research and secondary research is "primary sources contains information which is new at the time of publication; secondary sources contain material which is second hand and has been published before" (White, 2002). For the purpose of this study the author conducted a focus group interview, which will be discuss later in the chapter. The advantages of primary data are it provides original, new, up-to-date and detailed information, which is customized specifically for the study. Furthermore, the researcher has more control over the data collection process. The disadvantage of primary data collection is that it is time consuming and also expensive to conduct, it can also be difficult to trace and also there is a possibility of unreliability and biasness. The overall approach that will be used in this study is qualitative. Qualitative Research Creswell (1998) defines qualitative research as "an inquiry process of understanding based on distinct methodology traditions of inquiry that explores a social or human problem". ...read more. traditional media (Port 1999, Novak and Hoffman 1996), the experimental evidence suggest that consumers respond to much of the advertising on the Internet in the same ways they respond to advertising in more traditional media, at least with respect to traditional measures of advertising effectiveness. For example, Dreze and Hussher (1999) found respond to advertising on the Internet appeared to be easier to ignore. Similarly, Lynch and Ariely (200) found that consumers are less price sensitive when providers on the Internet offer different rather than identical products, a finding that directly parallels findings in more traditional retail settings. Traditional measures of advertising effectiveness, such as recall, attitude change and brand choice are only part of the story of effectiveness of interactive advertising. However, such measures are useful, but they are in the tradition of advertising research that focused on the advertising influence on the consumer; these measure offer limited insight into what the consumer does to and with advertising. Research that begins with the perspective that advertising does something to consumers treats advertising as an independent variable and advertising response as the dependent variable. The typical research paradigm involves a forced exposure to some advertising message followed by some measure of consumer response. If one accepts the position that people do things to and with advertising, the identity of independent and dependent variables is less obvious. Indeed, any response to advertising, include that of simply attending, may be contingent on a host of other factors. When people select that to which they attend, the act of attending becomes a powerful determinant of advertising response. The traditional paradigm for examining the effects and effectiveness of advertising has served the profession well, but it is incomplete in an increasingly interactive context. This suggests that there is a need for a new paradigm for the measurement of advertising effects. This new paradigm must explicitly recognise the active role of consumers; message recipients must also be potential message seekers. At the same time, any new paradigm must be ...read more. By looking at my questionnaire, a lot of amendments are not needed as a whole. A few people have emphasised on the promotion whereas a few others have emphasised on the product and price. into a very small file (about one-twelfth the size of the original file) while preserving the original level of sound quality when it is played. MP3 files (identified with the file name suffix of ".mp3") are available for downloading from a number of Web site. They have to declare their profits and accounts to the public because the public needs to know how good Boots is doing and if they are hitting their targets. Also, if people are looking to buy into the company, they need to know if the company is worth buying into etc. This creates a valid argument for the public actually being in control because of the increasing resistance of the media. However some people still believed the hoax, this could be down to the respected specialist in wildlife, Terry Jones, used to present the programme. Newspaper advertising can also be useful for smaller businesses. It was estimated that 40 million adults read a local newspaper. Newspapers know a lot about their readership so it's easier to target audiences more effectively. Technology is improving newspapers' capabilities to create clear photos, better colours and to use new techniques such as scented inks. As we see on the picture the man is happily doing the work while having a coffee. This again is the same technique used before, building up an aura of jealousy to the targeted audience for the user of the mobile, who is doing his work while having a coffee. graphic design for consumer markets, and CFA Community Marketing working alongside clients operating in the public sector. This marketing agency has resources and expertise to provide the business with marketing support to your business needs. Panther Interactive Marketing Background information Panther Interactive Marketing was formed in 1995 with a small contingent of highly qualified marketers. Modern advertising is an integral segment of urban industrial civilization, reflecting contemporary life in its best and worst aspects. Having proved its force in the movement of economic goods and services, advertising since the early 1960s has been directed in increasing quantity toward matters of social concern.